Last 32 hours here! The campaign on Kickstarter is getting to finish! The Backers' Skin Voting is online from now, in Super Tester Forum. Here is the Thunderbolt Horizon Corporation Private Military Company Pattern. Through this model we can see that the development for Thunderbolt is actually inextricable from Raider. The "Black Mech Squad" is some kinds of special mission force in U.N.F. Mecha Force, perhaps, some "wet works". 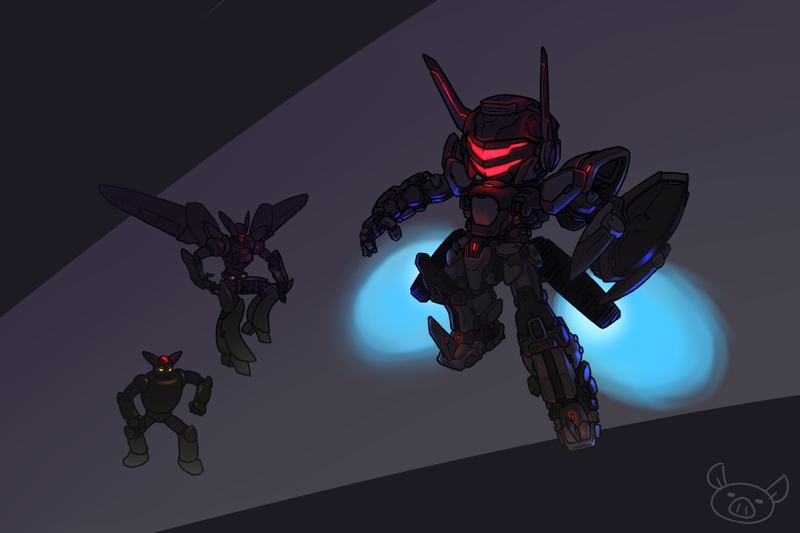 The Black Mech use black colour for coating, and customized mechas for mission requirement. Just voting for your favorite Thunderbolt skin! heizo, Lingxi Xu, and 45 more people like this update. Congratulation for successful backed, I hope the voting last longer days, due I just update to Union the last day and haven't received invitation to the secret base and super tester! Guys. The vote system is in their forum. I like the dark mecha. I wish we have it despite of voting. Well I rather like both options, but I guess I'd vote the PMC pattern by a slight margin. PMC since I have to choose. I vote PMC Pattern skin. Both are super well designed, but I'll vote for the PMC (white) color pattern. Super reminiscent to the Nu Gundam hehe. Both of them are awesome, but them both in! Everyone, you need to go to the backers forum to vote. Am I missing the voting link or will it be send seperatly? Where do we vote is there a link? Both are attractive, it will suffer. Or skins, it has details of the parts, not only the color be changed?